WASHINGTON — Fraught relations between the United States and Venezuela turned openly hostile on Monday as the U.S. slapped new visa restrictions on Venezuelan officials and their families and Venezuela’s president accused Vice President Joe Biden of plotting to overthrow him. Current and former Venezuelan officials believed to be associated with human rights abuses or corruption will be subject to the restrictions, which bars those individuals from entering the United States. In a first, the U.S. said its ban would also apply to the individuals’ immediate family members, too. Venezuela’s President Nicolas Maduro reacted angrily, saying he would write a letter to Obama over what he called an attempt to violate Venezuela’s national sovereignty. He argued that U.S. policy toward Venezuela has been kidnapped by “irresponsible, imperial forces that are putting the United States on a dead-end” in its relations with Venezuela and the broader region. At the same time, the U.S. dismissed as “ludicrous” Maduro’s recent claim that that Biden had conspired against him. In a televised address over the weekend, Maduro claimed that Biden sought to foment the overthrow of his socialist government during a Caribbean energy summit Biden hosted last month in Washington. According to Maduro, Biden told Caribbean heads of state that the Venezuelan government’s days were numbered and it was time they abandon their support. “What Vice President Jose Biden did is unspeakable,” Maduro said. Maduro, who is struggling to keep Venezuela’s oil-dependent economy afloat despite mounting problems, frequently accuses foreign governments of conspiracies, coup attempts and assassination plots, including the U.S. The U.S. and Venezuela have not exchanged ambassadors since 2010. But just one month ago, Maduro and Biden shook hands and expressed an interest in warmer relations during an impromptu meeting in Brazil. 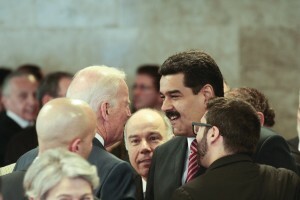 A photograph of Biden and Maduro smiling warmly at each other at Brazilian President Dilma Rousseff’s swearing-in ceremony became a meme in Venezuela, and Maduro described the meeting as “cordial.” U.S. officials later said Biden had offered ways Venezuela could pursue better U.S. relations, including by releasing political prisoners. Last year, the U.S. targeted 24 high-ranking Venezuelan officials with a travel ban and Obama signed into law sanctions legislation allowing him to freeze assets of officials involved in a crackdown on opposition protests. Many U.S. lawmakers have advocated for extending travel penalties to family members, noting that while Venezuelan officials themselves don’t tend to travel to the U.S., their wives and children are known to vacation here. The U.S. didn’t name the individuals being barred Monday, citing visa confidentiality laws. Left: Venezuela's President Nicolas Maduro speaks with U.S. Vice President Joe Biden during the sworn-in ceremony of Brazil's President Dilma Rousseff in Brasilia. Phto courtesy of REUTERS/Miraflores Palace.